From its origins as a ball room that hosted Duke Ellington and W.C. 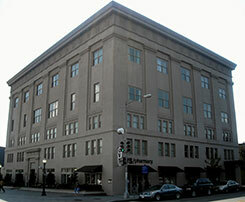 Handy to its current role as an entertainment and meeting venue, the historic facility Masonic Temple at 1000 U Street NW has remained a cultural center for northwest Washington, D.C. Managed by the Prince Hall Freemason and Eastern Star Charitable Foundation, a non-profit organization with the purpose of giving back to the community, this unique, historic space is home to an array of amenities and community events. With over 4,000 square feet of usable space, the Masonic Temple is open to the general public, civic associations, corporations, and private organizations for rental. The newly renovated Prince Hall Center for the Performing Arts at the Historic Masonic Temple is available for rental for social affairs, weddings, business meetings, corporate functions, civic gatherings, benefit concerts, music recitals, and fitness classes. Entertain your guests in a venue that values preservation. The original high quality acoustic sound and flooring of the performance stage and ballroom have been preserved. The center seats 500 patrons and features a full-service kitchen and upscale bar. For more information, contact the Prince Hall Freemason and Eastern Star Charitable Foundation, Administration office at (202) 667-5221 and ask for Ms. Tanya Slaughter (Ballroom Manager) or email phfescfcftpa@gmail.com. Discount prices are available for non-profit groups and organizations. We have many events scheduled throughout the year in our newly renovated Prince Hall Center for the Performing Arts at the Historic Masonic Temple. In the 1920’s, the Prince Hall Free & Accepted Masons built its six story building at 1000 U Street NW with construction commencing in 1922. The African American architect, Albert Cassell, is also known for prominent buildings on the campus of Howard University in Washington, D.C. and Morgan State University in Baltimore. The buildings primary use at that time was for meetings of its members both Prince Hall Masons & Eastern Stars. It also housed the downtown office for UPO, a duck pin bowling alley for the community, and one of two ballrooms that African Americans could rent for meetings and social affairs on U Street. What made the Masonic Ballroom so different then, was that some of the top musicians that played in this room were Masons themselves i.e. Duke Ellington, Lionel Hampton and W.C. Handy. The Masonic Temple was one of the few buildings on U Street to never closed its doors during the economic decline of the neighborhood following the assassination of Dr. Martin Luther King, Jr. in the 1960s. It always has been place for the African American youth, community leaders, politicians, and city activist to gather for debate. In the 1970s, The Masonic Temple again was the culture cornerstone for a new genre of music called Go-Go, which the Legendary Chuck Brown, the Godfather of Go-Go, made famous playing weekly for 20 years at the Historic Masonic Ball Room. In the 1990s, thanks to a revitalization project started by former Mayor Marion S. Barry and the location of The Civil War Memorial Museum inside the Masonic Temple by Frank Smith former City Councilman, 10th & U Street has come alive. The Historic Masonic Temple was given a face lift when CVS open its doors in the building and the newly renovated Ball Room has been renamed The Prince Hall Center for the Performing Arts. The building is now managed by The Prince Hall Freemason and Eastern Star Charitable Foundation, a non-profit organization with the purpose of giving back to the community. With the amenities of a metro stop, the Civil War Memorial, bars, nightclubs, hair solons, restaurants, art galleries, and diverse neighbors – 10th & U. Street is ready for next nostalgia at The Historic Masonic Temple.